With the PC returning to the forefront of the video game scene, gaming laptops are booming in popularity. Almost every major vendor – Lenovo, Asus, Dell and more – has a solution for what I call semi-mobile PC gaming. (And I say "semi-mobile" considering few, if any, gaming laptops can play for longer than an hour on their batteries.) But as it stands, few put forth a better value proposition than Gigabyte, a Taiwan-based firm that until recently was better known for its components than its full-built systems. 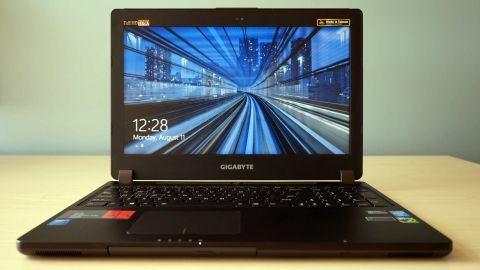 The company's latest, the 15.6-inch Gigabyte P35W v2, cements Gigabyte's status as one of the leading value brands in mobile gaming hardware. In short, you're going to get more for less with this machine, even if it looks a little rough around the edges. While the Razer Blade and MSI GS60 Ghost Pro 3K offer superior looks and superior screens they come with a premium price tag. (Not to mention that neither can match the amount or quality of components on offer here for the price.) That said, the Taiwanese vendor has made significant gains when it comes to build quality. With the deep gray brushed aluminum finish on its lid and palm rests, the P35W v2 does offer some of the trappings of a premium machine. Unfortunately, though, its thick black plastic bezel and smooth gray plastic base betray its less-than-fancy roots. It's almost tragic, given how much is right about this machine, design-wise. The P35W v2 wins major points for dispersing heat through two rear vents in the base. The dual-intake design, with fans located just above the keyboard on the base, manages to help the system keep relatively cool while gaming – "relatively" being the operative word here. It runs cooler than MSI's latest thin and light gaming notebook, but I still wouldn't play games with this thing on my lap. The vent placement leaves the speakers to the front of the base, just underneath the edge. But, as with most laptops, you'll be better off plugging in a pair of headphones. The Gigabyte's 1.5W speakers offer excellent volume, but produce middling bass and a thin register on the higher notes. Both the keyboard and clickpad are vast improvements upon Gigabyte's previous offerings. With bright, well-spread white backlighting, the membrane keyboard on the P35W v2 gives a bit of flex, but only under more pressure than you would exert typing. Otherwise, the keyboard offers strong feedback and quick travel – I had no tapping through games like World of Warcraft and Titanfall. While the clickpad won't get you through any game that's more intense than Hearthstone, the soft touch plastic tracking surface serves well for web browsing. The ElanTech-made sensor also tracks right-clicks with brilliant accuracy, though palm rejection is a bit hit-and-miss. Let's move right along to what counts in a gaming laptop: the inside.